The RBI has forecasted gross bad loans will decline to 10.3% of total loans by March 2019 from 10.8% at the end of September 2018 and 11.5% in March 2018. This is the first time since 2015 that the regulator has believed that the industry will report a decline in NPAs. Reliance Communications and Reliance Jio have extended till June 28 the term of the pact under which the former will sell some wireless assets to the latter. This comes amidst speculation that the deal between the two companies will not materialize. Paytm Payments Bank has received approval from the RBI to restart opening accounts for its customers. The RBI had asked the bank to stop adding new customers back in June when lapses were found on the part of the entity to stick to RBI’s requirements. Sazerac, US-based spirits company, has completed its acquisition of a significant minority stake in John Distilleries Pvt Ltd (JDPL), a leading liquor maker in India. Sazerac has acquired the 20% stake at a valuation of ₹1,000 crore, taking its overall holding to 43%. The Indian rupee entered 2019 on a positive note, building upon the gains of the previous two sessions and adding another 34 paise to close at 69.43 against the USD. This has been due to increased selling of the USD by exporters and smart gains in domestic equities. The market regulator, SEBI has decided to implement mandatory physical settlement for all stock derivatives by October 2019. According to a circular, the new system will be implemented in three phases starting April. The shares of Jet Airways crashed and rating agency ICRA downgraded its debt to D from C as the airline revealed that it had defaulted for the first time regarding repayment of dues. The airline’s share price ended at ₹263.75 on Wednesday, down 6.16%. Companies faced with a 30% tax bill over valuation-premiums are set to get relief after a recent government clarification asked officials not to scrutinise such transactions. Many firms had received tax demands after premiums were paid over the ‘fair price’ or ‘fair market value’ for fresh shares. About 500 midsized restaurant companies alleged misuse of dominant position by food delivery companies, signing an online petition addressed to the CCI and the PMO to this effect. The accusations include the use of deep discounting, in-house kitchens and internal sourcing. Indian stock indices slumped as a weak reading of China’s manufacturing data signalled slowing growth in the world’s second-largest economy weighed on sentiment across markets in Asia. The Sensex ended down 363 points at 35,892 points while the Nifty ended down 117.60 points at 10,793 points. Private equity group Apax Partners is poised to become the single-largest shareholder in Fractal Analytics by picking up a significant minority stake of around 45% for $175-200 million, valuing the firm at $350-400 million. Cars priced higher than ₹10 lakh may start costing Indians more, following the latest directive from the CBIC as it has said GST is payable on the invoice value plus TCS under the income tax act. The Supreme Court gave the National Consumer Disputes Redressal Commission the go-ahead to proceed with a class action suit brought against Maggi noodle makers Nestle three years ago by the Centre for allegedly selling noodles that fell short of food standards. GirnarSoft, the owner of online auto classifieds portal CarDekho, has raised $110 million from existing backers Sequoia Capital India, CapitalG, Hillhouse Capital and Axis Bank, valuing the company at $400-$500 million. The proceeds to be used to push insurance and financing business for used cars. Indian stock indices weakened for the second consecutive session on weak cues from overseas markets amid continued worries on slowing global growth. The Sensex ended about 378 points lower at 35,514 points while the Nifty ended down 120 points at 10,672 points. Several top corporates and banks are experimenting with virtual currency as a more transparent treasury management tool for optimal utilisation of working capital while being cautious about regulatory compliance. HUL, RIL, HDFC Bank, ABG Shipyard among cos running pilots for treasury management. The Supreme Court sought responses from Bharti Airtel and the DoT on a contempt plea filed by a group of Aircel employees, who accused the two sides of failing to release ₹453 crore to the debt-laden telco despite an earlier order of the apex court. Ambani brothers-led telecom firms have jointly approached the telecom ministry to seek clarification on the government’s stand over their spectrum trading deal. The DoT had put the spectrum trading between the two companies on hold after Jio refused to bear the burden on any past dues that RCom owes to the government. 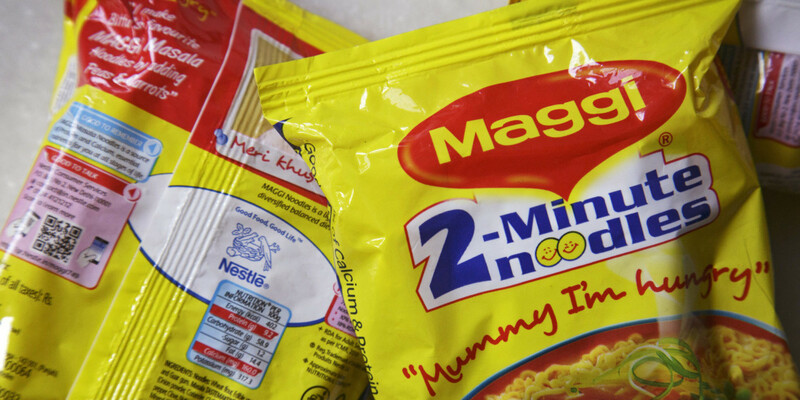 The Indian arm of Nestle is set to release advertisement campaigns highlighting the “trustworthy facts” about its instant noodles brand Maggi. This comes a day after the Supreme Court revived the class-action suit by the government against the company in the National Consumer Disputes Redressal Commission.